Discussion in 'New Member Introductions' started by Basset_Dad, Feb 3, 2019. Thank You for allowing me to join your group. I'm 65 years old, I've had four back surgeries, I have severe arthritis from the neck down & several other separate undesirable back issues. Not wanting to host a pity party let's just say I have a "back problem". I'm the original owner of my 2001 Tacoma SR5 4x4 5 speed / 4cyl. My family is encouraging me to sell my Tacoma and purchase a 2016 4Runner Premium so it would be easier on me to haul my two Boxers around along with my recumbent trike. My question is to the previous Tacoma owners. Do any of you 1st generation Tacoma owners ever regret selling their Tacoma's to purchase their 4Runners? I sold my 2000 Prerunner to purchase a 2016 Tacoma. Kept it a year and traded up to a 2017 4Runner TRD Premium. Never looked back and would never go back. 60 year old here. Backslider, Bob and Snickel Fritz like this. 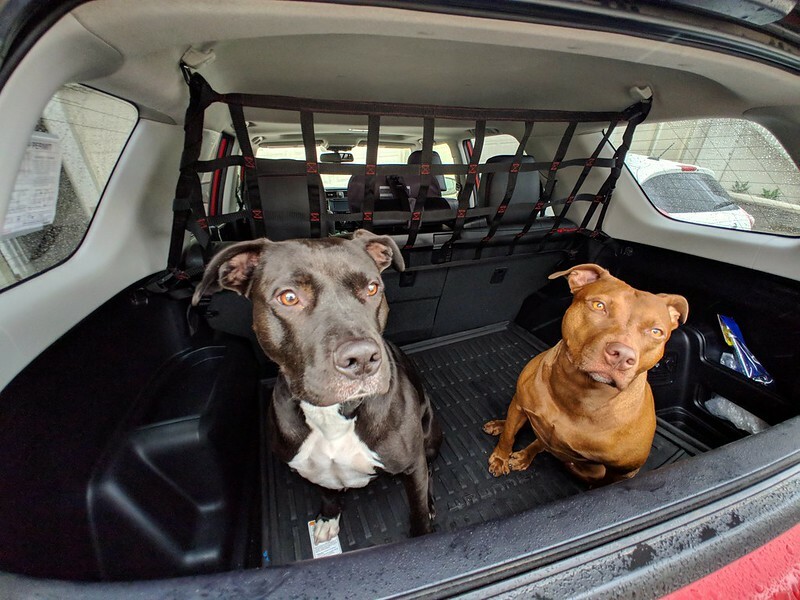 From an old guys point of view, i think you will be much more comfortable in the 4-runner, and the dogs will love you for it. Backslider, Kyblack76, Bob and 1 other person like this. Get the 4Runner. It’s so much more comfortable. Braves95 and Bob like this. Beautiful truck there, I can see why you'd hate to give it up. About the only thing I miss from my 2nd gen Tacoma is driving stick- everything else feels pretty similar and trucky except a little more plush. Make sure there's enough room in the rear cargo area to fit your bike. And dogs love the rear roll-down window! Honestly if you can afford it don't part with that 1st gen Tacoma and buy the 4Runner. If money is an issue get the 4Runner and never look back. Having that Tacoma as a knock around truck would be great...I sold a mint 1998 SR5 and 2003 TRD Offroad Tacoma and to this day I deeply regret selling them. I missed my 2012 Tacoma for about 3 months after trading it in for my 4Runner but now I would not go back to a Tacoma. However those 1st gen's offered such a magical simplistic experience which I feel will never again be replicated by Toyota. They were small, highly maneuverable, and indestructible. But it is completely understandable why you would ditch the Tacoma (ride quality and space). On a side note the SR5 suspension on my 1998 rode ten times better than any of my TRD suspensions even the 2nd gen...Good luck OP!! hordboy and WallyT4R like this. I agree with @Oey12, don't sell it if you don't have to. Get the new vehicle for your back and to make life easier but that truck you have is very nice an I would keep it if I could. I had two of those and wish I still had them. That is when Tacomas were very tough, I still see these on the road all the time. I went from a 2015 SR5 Prerunner DCSB Tacoma to a SR5 Premium 4Runner with the XP package and have zero regrets. Agree...If you can keep the truck and if the Runner works out maybe you can try to sell it later. I would not sell a 1st gen Tacoma, if I was the original owner. Perhaps get a basic 4Runner? The only regret you’ll have is not getting one sooner. If you list the Taco it won’t take long to sell. Don’t trade is as the dealer will beat you on it, You’ll definitely get more through private sale. I love my Tacoma but the 4Runner is nice too! If I were 65 with back problems, I would probly go for the 4Runner or keep both. As far as regretting the decision only you will know that. Good luck OP. Kyblack76 and HoBoDanny like this. I bought a 2000 Taco Pre-runner in California in 2001. It had 42,000 miles. When I sold it in 2014 it had 268,000 miles and ran like a champ. I regretted it after buying a 2002 Silverado 2500 and going through all of the associated Chevy problems. I did have the Taco's frame coated when the message came out around 2009 I think, but rust was never an issue with that truck, I had it on the west coast for many years. I just picked up a 2004 Taco 4X4 with 72,000 original miles, from North Carolina last month, which had obviously had the frame coated. When I went to install the class 3 hitch, I discovered the tail ends of the frame were almost gone from rust.... I was sick at my stomach. I called the dealer to see if they could help, turns out my truck meets all of the requirements for a new frame STILL: It's within 15 years of it's first use (by 5 months), was sold and used in a cold weather qualifying state (Maryland & Vermont), it had the initial coating performed by a certified Toyota facility and finally failed the "10 mm punch test" when performed at the dealer I took it to. So now I'm in a 2018 loaner Taco while my new frame is on order. I apologize for the long answer to your question, but I would never part with my Tacoma again. We now have both a Tacoma and a 5th Gen 4 Runner and we are tickled to sh!t to have vehicles that we know are going to last us a very, very long time. Every man needs a pick-up truck. It's not until you don't have one for a while; that you remember why you had one in the first place. Thats great they are replacing your frame. Youll get alot more years out of it for sure. I dodged a huge bullet for sure. You got lucky with that one! I thought all the frame replacements were over for 1st gens. Most dealerships try to avoid them like the plague if they can. Since they don’t make much money for doing them. Make sure they replace all associated parts. There’s a list on Tacomaworld of everything that should be replaced when the frame is replaced. The dealer in Virginia Beach that will be doing the swap actually has a parking lot with around 20 trucks on a waiting list for frames. I drive by there weekly and there is a stack of frames next to the service center that fluctuates in size. They have a dedicated team of 4 guys and 2 service bays that does nothing but frame swaps. Since Virginia is one of the qualifying states, they are are actually getting reimbursed quite heavily for their efforts in correcting the $8 billion dollar (seems to be the last projection I read, but is referenced a lot at $3.5 billion) lawsuit. The qualifying criteria which was updated in 2017 simply states "any Toyota truck" which includes Tundras and Sequoias that are within 15 years of their first use (date can be found in a VIN search): Also located in a "cold weather state" which is a list provided in the service bulletin that is also on Tacomaworld forum with the parts list you referenced: Further, the vehicle in question must have had the "corrosion preventative coating" sprayed/applied by a "certified Toyota service department" when that particular bulletin was released: Even further, if the vehicle meets all of those requirements.....it must fail inspection performed at a Toyota certified repair facility (factory bulletin with instructions to Toyota mechanics also posted on Tacomaworld) which states that a "10 mm (or greater) hole" must be present or must be able to be created by a certified Toyota mechanic utilizing an approved steel rod "checking" (a.k.a. punching) specific inspection points on the frame. In most cases (including mine) the typical point of failure is directly forward of the forward most rear leaf shackle. Mine was as brittle as corn flakes in that area.....cleverly disguised with that nice CPC spray coating. They have a dedicated team of 4 guys and 2 service bays that does nothing buy frame swaps. Since Virginia is one of the qualifying states, they are are actually getting reimbursed quite heavily for their efforts in correcting the $8 billion dollar lawsuit. The qualifying criteria which was updated in 2017 simply states "any Toyota truck" which includes Tundras and 4 Runners that are within 15 years of their first use (date can be found in a VIN search): Also located in a "cold weather state" which is a list provided in the service bulletin that is also on Tacomaworld forum with the parts list you referenced: Further, the vehicle in question must have had the "corrosion preventative coating" sprayed/applied by a "certified Toyota service department" when that particular bulletin was released: Even further, if the vehicle meets all of those requirements.....it must fail inspection performed at a Toyota certified repair facility (factory bulletin with instructions to Toyota mechanics also posted on Tacomaworld) which states that a "10 mm (or greater) hole" must be present or must be able to be created by a certified Toyota mechanic utilizing an approved steel rod "checking" (a.k.a. punching) specific inspection points on the frame. That’s awesome! I didn’t know the 4Runner were covered. My 2001 Tacoma had its frame replaced in 2013. It was almost rusted in half just forward of the leaf mount. Well damn! The 4Runner is always excluded. I don’t think they corrode as bad as the Tacoma’s but they do corrode and should have some sort of coverage. Oh well. Thanks for the link. I had a 1st gen Tacoma. I now have a 3rd gen tacoma and a 5th gen 4 runner. Love the 4runner! If I had to pick one it would be the 4Runner no questions asked. Here's the latest from Toyota on frame inspection, ....it does say 2005 is the oldest model, but I can guarantee the language is "within 15 years of first use" . The Tacoma frames were made in the US by Dana Corporation. Toyota sued them and actually won some money from them for these rusting frames. The 4 has always been made in Japan with obviously different steel and have never really had an issue unless really exposed to the salt. This is normal as salt/brine and steel don't mix. All that needs to be done is to maintain the vehicle and keep an eye on things. I fluid film yearly. This year I plan on coating the inside of the frame with something because it seems the 4runner frames rust from the inside out. Not gonna happen to mine. I completely agree with maintaining them. I fluid film the runner and my Tacoma. I just think it’s weird that a Chevy express van frame won’t rust through at all after 20 years in the salt belt with no maintenance while a runner will rust through if not carefully maintained. I'm guessing some manufacturers prep their frames better or differently than others. The GM's have a rubber type coating on their frames. No vehicle is perfect and each one has it's little issues. Toyotas have always had this frame rust issue it seems. It's also the only brand I have owned that I have ever done undercoating on.